I am starting to realize that I’m not the most morningish of people. I can wake up early when I have to, but I don’t have much zest for life before about 8:30. For me, cooking breakfast takes zest. Early work mornings mean coffee and a banana or, if I’m lucky, a granola bar for breakfast. Not really a “meal” to be proud of, and then I get a case of the mid-morning grumpies because (surprise!) I’m hungry. I’m terrible at keeping quick breakfast foods in the house, usually because they either require money (in the case of cereal) or extra work (for things like muffins or pre-made mini quiche). I think I’ve finally figured out a way to keep something on hand that is cheap, filling, doesn’t take much prep and can be “cooked” even on the most rushed mornings. Instant oatmeal packets are great, but too expensive, sweet, and not quite enough food for an adult. So, I made my own. 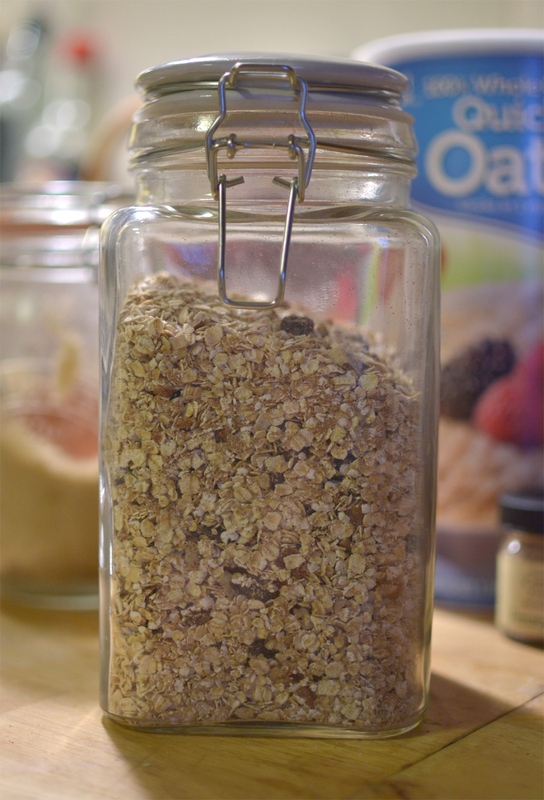 I really should not be so proud of the fact that I made, essentially, something as basic as a big jar of instant oatmeal packets, but there it is. Considering how not-good of a breakfast maker I’ve been recently, this is kind of an accomplishment. For this first batch, I used dried blueberries and toasted pecans, with a dash of cinnamon and brown sugar, but you could do any combination of fruits, nuts, or spices that strikes your fancy. We have a jar of dried currants here, waiting to be put in the next batch. Any suggestions what spices or nuts might go well with those? This recipe can be totally gluten free, if you buy GF oats and opt not to add any wheat germ. A couple tablespoons of toasted wheat germ or ground flax seed, if you want. Mix all the ingredients together in a large airtight jar. When it’s time to eat, combine 2/3 cup of the mix with 1 cup of boiling water (or 1 1/4 cup for thinner oatmeal) and let it sit, covered, for a minute. You could also prepare it on the stovetop, following the instructions on the canister. If you don’t eat it all first, this should last for several weeks in a lidded container. Tags: breakfast, budget, gluten free, recipe, vegan, vegetarian. Bookmark the permalink.